If you are the type of person who uses several devices to work online, I'm sure you must be using, or at least wishing to use, a method for syncing files and directories among those devices. BitTorrent Sync, also known as btsync for short, is a cross-platform sync tool (freeware) which is powered by BitTorrent, the famous protocol for peer-to-peer (P2P) file sharing. Unlike classic BitTorrent clients, however, btsync encrypts traffic and grants access to shared files based on auto-generated keys across different operating system and device types. More specifically, when you add files or folder to btsync as shareable, corresponding read/write keys (so-called secret codes) are created. These keys are then shared among different devices via HTTPS links, emails, QR codes, etc. Once two devices are paired via a key, the linked content can be synced directly between them. There is no file size limit, and transfer speeds are never throttled unless you explicitly say so. You will be able to create accounts inside btsync, under which you can create and manage keys and files to share via web interface. BitTorrent Sync is available on multiple operating systems including Linux, MacOS X, Windows, as well as Android and iOS. In this tutorial, I will show you how to use BitTorrent Sync to sync files between a Linux box (a home server), and a Windows machine (a work laptop). BitTorrent Sync is available for download from the project's website. I assume that the Windows version of BiTorrent Sync is installed on a Windows laptop, which can be done very easily. I will focus on installing and configuring it on the Linux server. You can now either add /usr/local/bin/btsync to your PATH environment variable. or run the btsync binary right from that folder. We'll go with the first option as it requires less typing and is easier to remember. You can choose any username and password. Feel free to check the README file in /usr/local/bin/btsync directory if you want to tweak the configuration further, but this will do for now. As system administrators we believe in logs! So before we launch btsync, we will create a log file for btsync. That's enough by now. Please install BitTorrent Sync on your Windows machine (or another Linux box, if you want) before proceeding. 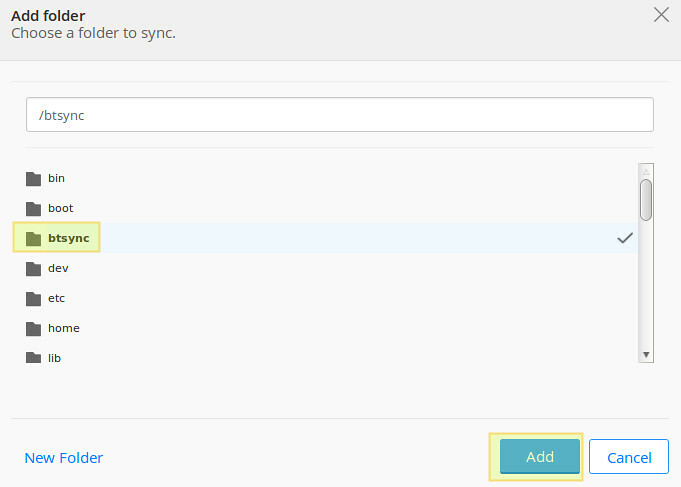 Now repeat the process for other computers or devices; selecting a folder or files to share, and importing the corresponding key(s) in your "central" btsync installation via the web interface on your Linux server. You will notice that the synced files in the screencast were created in the /btsync directory belonging to user and group 'root'. That is because we launched BitTorrent Sync manually as the superuser. However, under normal circumstances, you will want to have BitTorrent Sync start on boot and running as a non-privileged user (www-data or other special account created for that purpose, btsync user for example). Based on your chosen distribution, you may find other ways to enable btsync to start on boot. In this tutorial I chose the rc.local approach since it's distribution-agnostic. As you can see, BitTorrent Sync is almost like server-less Dropbox for you. I said "almost" because of this: When you sync between devices on the same local network, sync happens directly between two devices. However, if you try to sync across different networks, and the devices to be paired are behind restrictive firewalls, there is a chance that the sync traffic goes through a third-party relay server operated by BitTorrent. While they claim that the traffic is AES-encrypted, you may still not want this to happen. For your privacy, be sure to turn off relay/tracker server options in every folder that you are sharing. Hope it helps! Happy syncing! Nice tool, but you might also want to have a look at git-annex, which also synchronize between different computers. Really nice tool, actually, where you can use many different cloud storages, and your own, to sync files to different computers. And you don't need to store every file on all devices. This is a good point. I think in case of btsync, the value is not so much in the sync speed, but rather in the automatic NAT traversal capability of the BT protocol. So using btsync you can sync devices across different NATs, which you cannot do with owncloud. installed so as to run as another user. The point in using grep -v grep is to only show btsync in the output of ps -ef. If you omit grep -v grep you'll also get ps in the results. In addition, I never suggested btsync should run as root. Actually, I explained that it should run as a non-privileged user, btsync in this case. Did you read to the bottom of the article? If you refer to the image right above the lines you quoted, you will see that when the tarball was downloaded using wget, the current working directory was /usr/local/bin. Oops! Thanks for straightening me out, Gabriel. Where's the source code? Oh, wait...it's not available. TROJAN HORSE! There's no way I would recommend using this "tool" unless the source code came with it. From what we know, it spies on you through your browser and "phones home" with whatever profile it's collected about you. I'll stick with rsync across an SSH tunnel, thanks. For Microsoft Windows users, you're already pwn3d anyway, so maybe it doesn't matter so much to you. But Free Software users (GNU/Linux, *BSD) should know better. I am also a huge advocate of Free Software. However, in all honesty, I do not understand why you're so sure about btsync being a trojan horse. Or are you guys calling it that because it's closed-source?